Gericke, Regensdorf, Switzerland, evolved from humble beginnings towards the end of the 19th Century to become a globally positioned and highly respected provider of innovative bulk handling and processing equipment and systems. Ing. Walter H Gericke in 1894 founded his machine and mill building factory in central Zürich. He rapidly acquired a reputation as a specialist supplier of modern milling plants, many of which were already part automated. At the beginning of the 20th Century Gericke built its first vertical mixers and celebrated a major success with its patented Soder-mills, which provided higher yields. 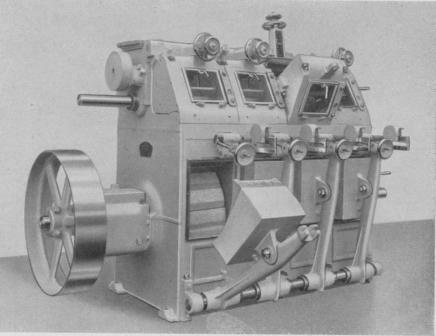 Further innovations followed in the 1940s with the development of pneumatic conveying systems and vibratory dosing units as well as steel band conveyors for chocolate industries. By this time Otto and Walter Gericke, the second generation of the family-run company, were already at the helm. From the 1960s Dr Hermann and Willi Gericke established significant milestones with the internationalisation of the company. Focus was on new technologies, whereby more specialist types of machines were added to the programme through licence agreements with US companies. These included differential weigh feeders, sack compactors and continuous granulators. Machine installations for production of high-quality baby food were already a Gericke speciality by then.